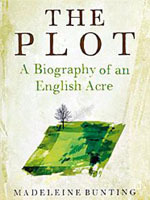 On one level a biography of Madeleine Bunting’s father, but also a history of a small piece of land on the edge of the North York Moors owned by her father, “The Plot – a Biography of an English Acre” is a book you will want to read. It’s both the story of her father and his “English acre”, but, more than that, it’s about our relationship with the land and how we can develop strong ties with a particular piece of land. For this reason it’s a compelling book for anyone thinking of buying a piece of land of one’s own. Bunting relates the 80 year story of forestation around the one acre plot at the centre of the book – from felling in 1914-1918 for the First World War, which required timber for 2,000 miles of trenches, through coniferous planting in the 1950s, to some replanting with mixed broadleaves in the 1990s. There is one particularly inspired chapter in which she describes in detail the process of aforestation that took place in the 1950s, which, she says, is still resented by many people today. The 61,000 acres that were planted on the North York Moors made the Forestry Commission the largest local landowner: “These were forests planned on an office drawing board … edges and corners often drawn with a ruler … never destined to be maintained or harvested by the local villages”. Bunting observes that these conifer blocks were a “statement about 20th century warfare” where the initial idea came out of the First World War and the planting methods from the Second World War, yet their purpose was imagined to be in pursuit of another imminent war. “Trees pass down generations, like a message in a bottle,” according to Bunting and, although it is hard to know what is best for our woodlands, whatever happens, “people will still need wood and they will also need places to play”. Conifers surround the chapel building at the centre of the story and, towards the end, in 1995, the conifers are felled and finally the chapel gets back its view across the moors – “the wheel is slowly turning full circle”. “The Plot” is both descriptive and analytical. It covers the broad sweep of 20th century history through the prism of this one acre, yet it is also intensely personal. Bunting’s father dies and her feelings of loss at the death of a parent are made much more intense by being linked to a single place. At the end, after following this single acre of land for 1000 years we realise our own transience, yet we feel a concern for this plot of land going far beyond any question of who actually owns it.